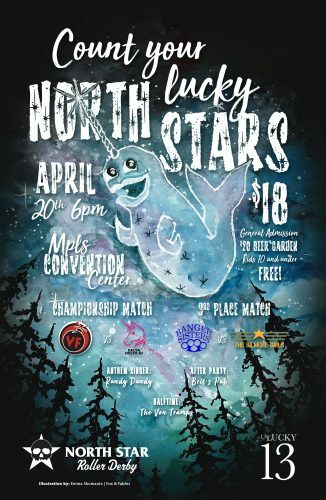 This Saturday, April 20 will cap off North Star Roller Derby’s 13th season. We’re taking to the slick polished concrete at the Minneapolis Convention Center in the heart of downtown Minneapolis to see who will take the trophy. To fire it up, the Banger Sisters will face off against the Kilmore Girls in bout 1. The Kilmores haven’t seen a win this season, but that’s not for lack of talent. Kilmore rookie Sassberry is the scoringest newcomer of the season with 73 points under her belt. That makes not only the highest-scoring rookie on the league, it also makes her the highest-scoring Kilmore. She’s scored only five fewer points than the Bangers’ highest-scorer, shE. Coli, who’s managed to crank out 78 points for the season. Both teams have deep jammer pools, sometimes calling on eight or nine folks to don the star in one game. The battle for third place comes down to endurance and smarts—and whether or not either team can stop those leading scorers. Between-bout entertainment will be provided by The Von Tramps, a seriously badass group of female punk rockers. The championship bout pits The Violent Femmes against Delta Delta Di in what’s sure to be one heckuva rematch. Not only are the Femmes coming into this bout as undefeated reigning champs, but they’re also packing some heat with two of the league’s top three scorers, Amanita and The Fawkes. Amanita’s posted an impressive 126 points in season 13, with The Fawkes not far behind at 114. The Femmes keep to a tight jammer rotation, which helps keeps jammers focused on jamming and blockers focused on blocking. There’s no time to dilly-dally or get distracted while sorting out roles during the game. Delta Delta Di is home to the league’s third highest-scorer. Annaconda can also take credit for bringing home 114 points this year, but the jammer line is solidly supplemented by Hitlist and Short Stack, as well as veteran pivot Killroy (who manages to rake in big points every game, too). The Violent Femmes eked out a 34-point win the last time these two teams faced off, in large part because blockers in red were able to cut off any big-scoring Delta jams before they were even a thought. Both teams will be rostered with players who weren’t in the game in their last showdown. With this trifecta of high-scoring jammers, dream-smashing blockers, and a few new skaters in the mix, this champs game is really going to be the wild west. You probably wanna come to see how this all shakes out. No matter who wins on the track, though, we all win at the after party at Brit’s Pub! See you there! And don’t forget to VOTE on your favorite skaters, officials, moments and more from unLucky Season 13! Online voting is open through Sunday and paper ballots will also be available at this Saturday’s championship bout.